This post is a bit of a test in a couple of ways: to see how my new tablet does this whole process, and also to see if this new-to-me style is good or a bust. Technically, this is a half-beer. It is 50% beer & 50% grapefruit juice. As soon as you open it, there is an overwhelming grapefruit smell. Well, some kind of grapefruit, anyway. It's quite yellow and smells a bit different from the ones I am used to (more like a pomelo or something?). That being said, this cloudy yellow brew with the pure-white head does smell enticing. 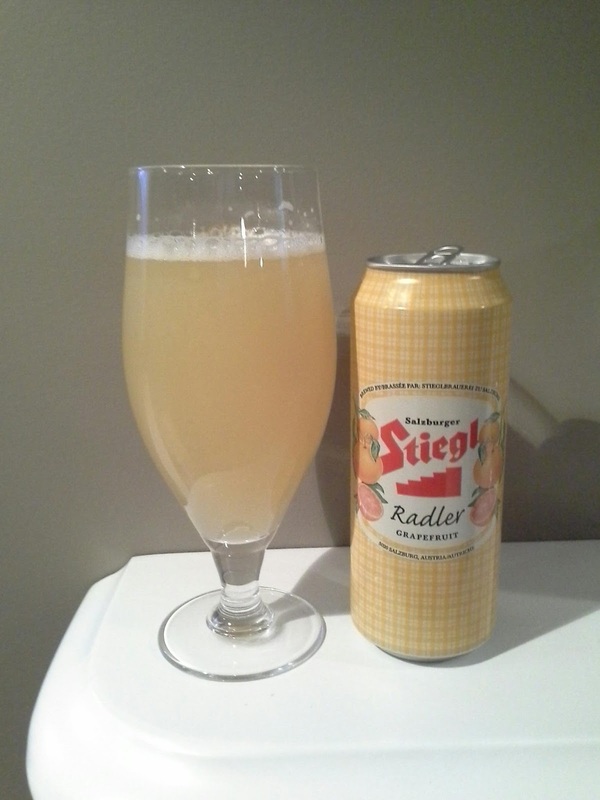 The flavour is surprising... it is fruity, but it does not match the aroma and it is a bit too sweet, perhaps. I really wish it tasted like it smelled. Of course, it is light and has a wet finish... and rather medium carbonation. All-in-all, it's pretty refreshing and summery, but I wish it lived up to the aroma. Almost there, but a bit too non-beery for me to visit it often.